The Deloitte Technology, Media and Telecommunications (TMT) Predictions report has been released, and it offers one of the most comprehensive views into how Canadians will interact with technology in the coming years. The 17th edition of the annual report covers a lot of ground, looking at everything from rising machine learning innovation to the sheer prevalence of subscription models for consumers. The report looks into global expectations but also outlines specific North American numbers too. Augmented Reality—More Than Just Pokemon: Deloitte is predicting that over one billion smartphone users will create content at least once in 2018 with augmented reality, mainly coming from the use of a camera lens. Tens of thousands of new AR-enabled apps will be released in the next year, allowing anyone with a smartphone to use the technology. The report goes on to describe how AR is not exactly new, but will be widely adopted in the coming year, allowing users to do everything from joining their favourite singer on stage to juggling a ball with a tiger. 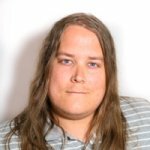 The major genre will be gaming though, as developers try to incorporate the technology in order to drive engagement. The AR industry’s revenues are expected to jump to $1 billion by 2020, compared to just $100 million in 2018. Smartphones—Annoying and Innovative: By the end of 2023, over 90 per cent of adults in developed countries will own a smartphone, compared to 85 per cent in 2018. Close to 1.85 billion smartphones are expected to be sold in 2023. On top of the sheer market penetration of smartphones, mobile devices will consistently improve and be used more often. Over the next five years, mobile devices will consolidate their position as the main way to access digital content, as upgrades to connectivity, processing power and AI will lead to more personalization and accessibility. Smartphones will be an amazing tool for both consumers and businesses, but they will also lead to a lot of lost time. Deloitte has found that many users are actually quite content with using their phone all day, sometimes looking at it hundreds of times. But what they hate is when they keep getting distracted by a smartphone when they need to get work done. An interesting note is that the “annoyance” from smartphones differs wildly from country to country. One in five Japanese citizens do not think they excessively use their phones, while three in four Mexican smartphone owners actively try to limit their use. In terms of added innovation that may keep people glued to their mobile screens, a new generation of machine learning technology will soon come to all smartphones. Applications will use less power while at the same time being more responsive and flexible. This is thanks to the prevalence of computer chips like FPGAs and ASICs—there were 100,000 to 200,000 chips like these in global data centres in 2016, and the report suggests there will be 800,000 by 2018. Machine learning will extend beyond mobile devices too. 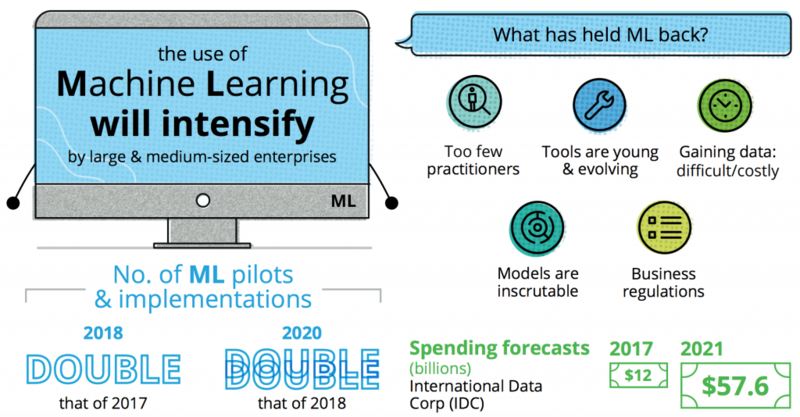 The use of the technology by medium and large businesses will grow immensely by 2020, with a special focus on five key areas: automating data science, reducing the need for training data, accelerating training, explaining results, and deploying logically. As these vectors grow, machine learning will become more popular and expand the market. We’ll Do it Live! 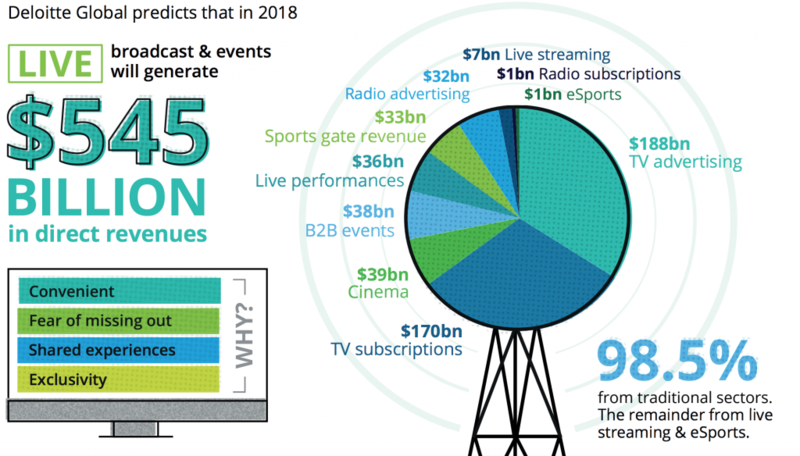 : Deloitte is predicting that live broadcast events will generate $545 billion in direct revenue in 2018, a slight one per cent increase over 2017. Around $8 billion of that will come from non-traditional avenues like esports and live streaming. Live broadcasting is still a bell cow despite the prevalence of subscription and on-demand models. Advertising will still bring in huge chunks of cash, with around $220 billion coming in from the TV and radio-based advertising industry. 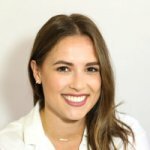 “Even in an age in which the mantra for media is often ‘what you want, when you want it, where you want it,’ the way we want to consume is often ‘now’ because of the thrill and convenience of live delivery,” reads Deloitte’s report. Massive tech companies are joining in the fun as well, with Facebook set to stream baseball and soccer, YouTube showing Champions League, and Twitter and Amazon both showing football games. 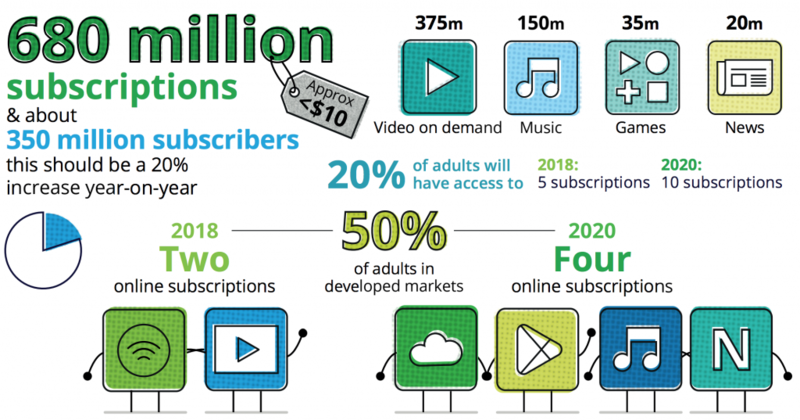 The Subscription Prescription: By the end of 2018, 50 per cent of adults in developed countries will pay for at least two online-only media subscriptions. That number will jump to four by 2020, a trend that shows how widespread this relatively new payment model is and how effective it can be. As more companies begin to offer an online subscription model, these numbers will grow. Consumers will become more willing to purchase content online and avoid advertisements. Add this to the ease of signing up new customers as well as better quality mobile devices, and subscriber content will be a new constant for businesses and media companies. 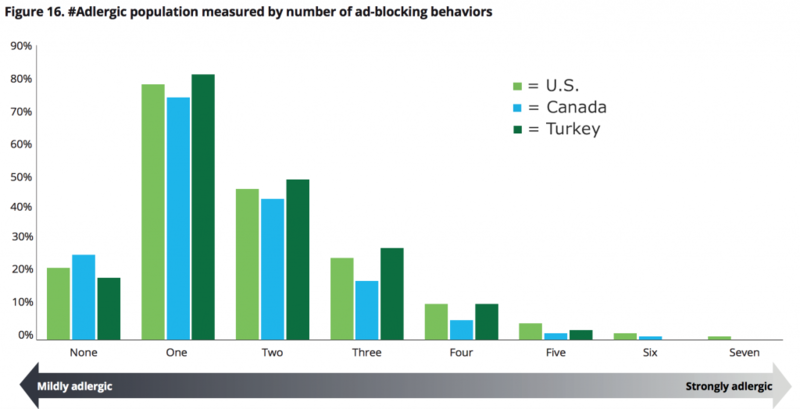 The Rise of Adblocking: Deloitte is predicting that 10 per cent of North Americans over 18 will use four or more adblockers in 2018. The rise of these “adlergic” consumers is growing, but most prevalent among millennials. One thing to note is that almost no one blocks every single ad. This doesn’t count impossible to miss advertisements like highway billboards, but anything that is actually blockable online. Deloitte puts these reports together to give consumers and businesses a glimpse of what technology and media will look like over the next one to five years. As many might have seen, AI and machine learning will play a big role, but it seems live TV and subscription media models are finding a way to happily coexist.